How not to treat a car worth $2.5 million. Having only debuted at this year's Geneva show back in March, the incredibly powerful, not to mention astronomically expensive, Bugatti Chiron hypercar hasn’t technically entered production. Yet someone has already crashed one into a ditch. Probably not the best way to treat a car worth around $2.5 million, but at least it wasn't a consumer car so all 500 models reserved for buyers should still be safe. The unfortunate accident occurred in Wolfsburg, Germany. This happens to be where the headquarters of Bugatti’s parent company Volkswagen Group is based, so chances are the car was being driven by a VW test driver in what looks like a private test track. Backing this up is an official statement from Bugatti: “The driver was unfortunately a little inattentive, which is why the car landed in the road ditch,” a spokesperson told German publication Bild. “Fortunately, nobody was hurt.” Unfortunately, the same can’t be said for the crumpled Chiron, which didn’t even have the dignity of being rescued by a tow truck: instead, an image posted on GTBoard's Facebook page shows it attached to a construction vehicle having its mangled metal dragged along the tarmac. 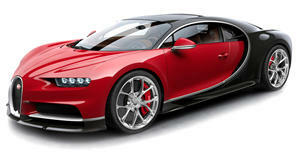 Other than Bugatti’s vague statement, the exact circumstances of the accident are unknown. Considering the Veyron successor packs an 8.0-liter W-16 engine delivering 1,479 hp and an insane 0-60 mph time of 2.5 seconds, you imagine it to be a handful to drive, so it’s perhaps not surprising to see it involved in an accident so soon. Of course, you also can’t help but wonder how fast the Chiron was being driven. All we know is, it wouldn’t be any faster than 261 mph.